Anew you died in peace O Irene. On the fifth Irene was beheaded and raised and died. She was the only daughter of King Licinius and Licinia her mother, and was from the city of Magedon. Born in the year 315, her parents gave her the name Penelope. Because she was fair and exceeded the beauty of all other maidens of her time, she passed her time in a tall tower that was built by her father. There she was with thirteen fair servants, having much wealth and a throne and a table and a lampstand, all of which were made of gold. When she was confined by her father to live in the tower, she was six years old, and there she was educated and taught by an old man, whose name was Apellian, who was confined there by her father Licinius. One day the Saint beheld a dove enter the tower, holding an olive branch in its beak, which it placed on the golden table. She also saw an eagle holding a crown made of thorns, that also placed it on the table. Then she saw a raven enter through another window, holding a snake, also placing it on the table. When the maiden saw this, she was perplexed and wondered at the meaning of this. Her teacher the elder Apellian explained to the maiden, saying: "The dove signifies the education of the mind, while the olive branch signifies the sealing and beginning of things and is a type of Baptism. The eagle, being the king of birds, foreshows by means of the crown, the victory you will have through chosen and good things. The raven with the snake signifies that you will taste of suffering and anguish." To quickly summarize, by this explanation of Apellian regarding the realities of this vision, he revealed the martyric struggle that the Saint would complete for God. These things said of the Saint are paradoxical and supernatural. 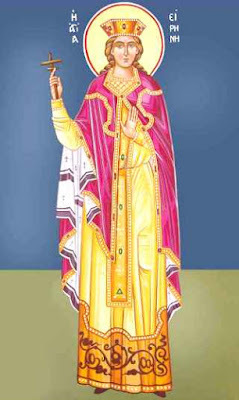 It is also said that an Angel of the Lord changed her name from Penelope to Irene, and that an Angel of the Lord taught her the faith of Christ, foretelling to her that a myriad of souls would be saved through her, and that in a paradoxical manner the Apostle Timothy, the disciple of the Apostle Paul, would come and baptize her. 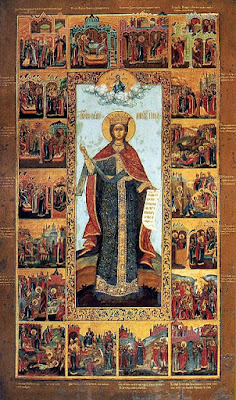 When all these things took place, then the blessed Irene toppled the idols of her father and destroyed them. Therefore she was first questioned by her father, who found her persisting in the faith of Christ, and he ordered that she be bound and be trampled by horses. One horse, instead of bringing harm to the Saint, went wild against her father, and throwing him to the ground, it trampled on his right hand, and it killed him, while it magnified the Saint with a human voice. 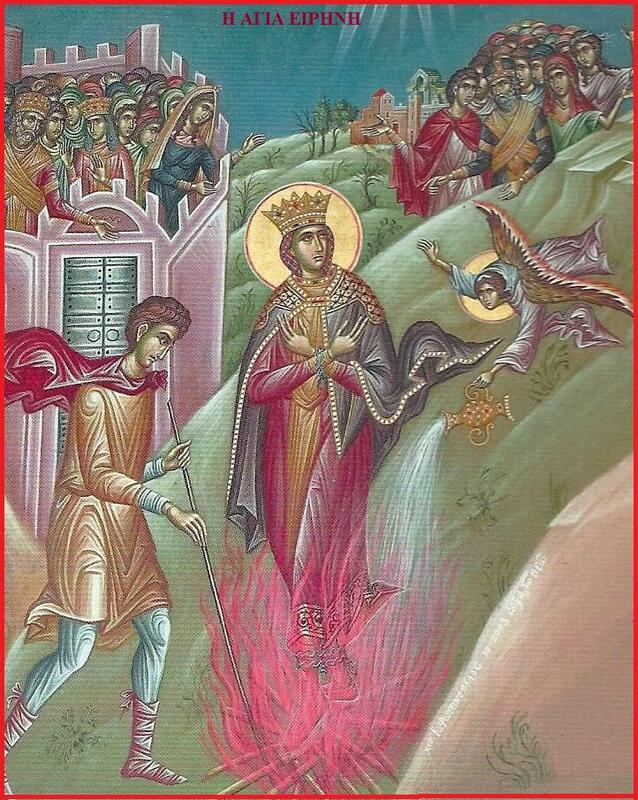 Released from her bonds, bystanders pleaded with the Martyr, and through her prayers she raised her father, who in turn believed in Christ, together with his wife and three thousand other people, and they all accepted Holy Baptism. Her father then forsook his kingdom, and went to dwell in the tower that he built for his daughter, where he spent the rest of his life in repentance. After her father died, another king came to the throne, whose name was Sedekia, who urged the Saint to sacrifice to the idols. Not persuaded by him, he threw the blessed one head first into a deep pit, in which were various poisonous snakes and reptiles. After fourteen days there, she emerged unharmed. Then they sawed off her legs, but by the aid of a divine Angel she was restored to health. They then bound her to a wheel, but the water which turned the wheel ceased flowing, so the Saint remained unharmed. By this miracle, eight thousand souls came to believe in Christ. 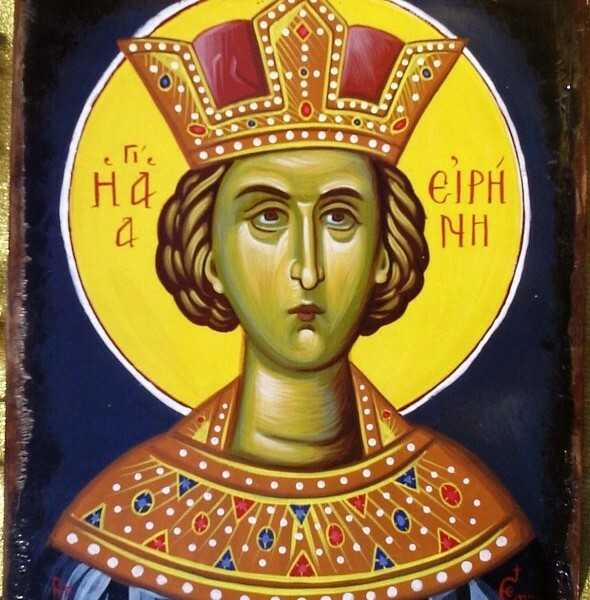 When Sedekia was ousted from his kingdom, and his son Shapur went to war against those who had his father removed from the kingdom, Saint Irene met Shapur and his army outside the city of Magedon. And after saying a prayer, she made them all deaf and blind, so that they were unable to see where they went, and after praying again she gave them all back their hearing and sight. For this reason they pierced the heels of the Saint with spikes, and they loaded her back with a sack full of sand. In this manner she was forced to march for three miles. Then the earth suddenly split in two, swallowing ten thousand of the unbelievers, which in turn brought thirty thousand people to believe in Christ. Yet the king still remained in his unbelief, therefore an Angel of the Lord struck and killed him. The Saint then received permission and freedom to enter the city, where she worked many miracles. Going to the tower in which was her father and the priest Timothy, she brought five thousand Greeks to believe in Christ by her teachings. With them were thirty-three men, who had been ordered to protect the tower, and they all received Holy Baptism. Entering the city of Kallinikos, where Numerian was king, a relative of the former king, she stood before him and confessed Christ. In return he had her placed in three red-hot brazen bulls, moving her from the first to the second and from the second to the third. The third bull, although lifeless, strangely began to walk, then it split asunder, and the Saint emerged unburnt and unharmed. Many unbelievers, up to a hundred thousand, saw this wonder and believed in Christ. 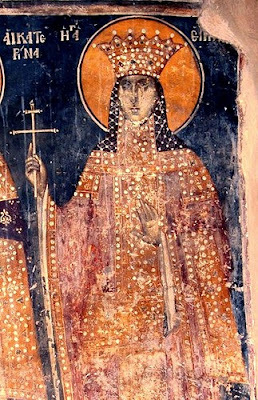 When the king was about to die, he delivered the Saint to the governor in order to have her punished with various torments. The governor bound the Martyr in chains, and had a fire lit beneath her. However, an Angel of the Lord came down and extinguished the fire, thus protecting the Saint. When the governor saw this, he believed in Christ with his men. 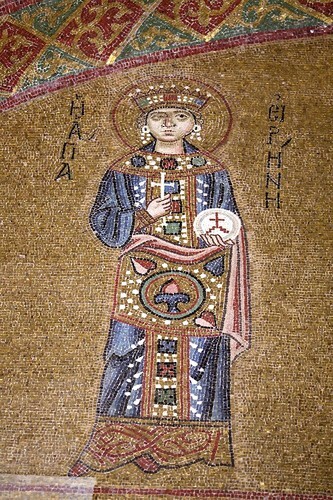 Because the fame of the Saint spread, the Persian king Shapur II (309–379), who reigned during the years of Constantine the Great, heard of her and wanted the Martyr beheaded. 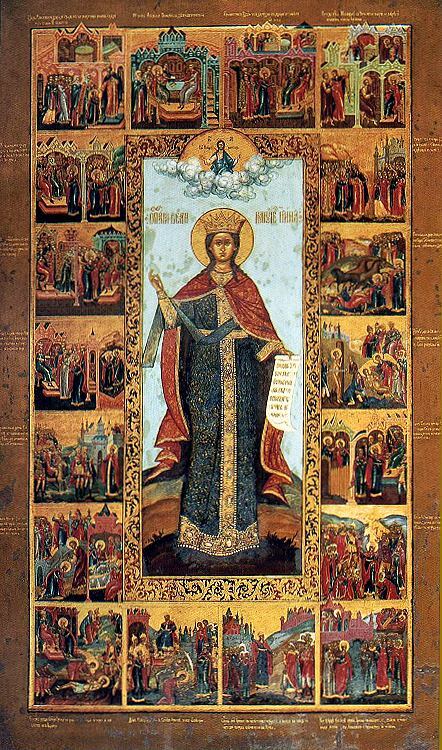 Therefore, Christ's victorious Irene was beheaded and placed in a tomb, but again by a divine Angel she was raised up, and he magnified her for having been martyred for Christ. She was magnified also by those who came to believe in Christ through her. 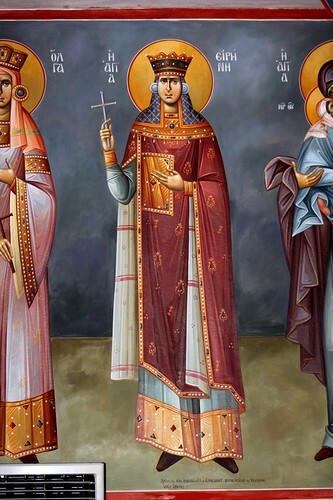 Thirdly, she is magnified by all those who commemorate her name, and celebrate the day of her martyrdom. 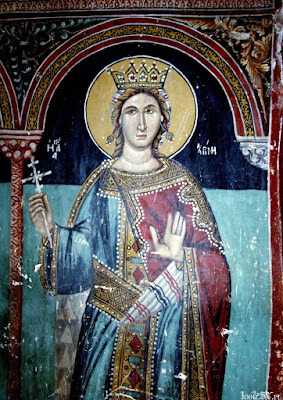 Having been raised, it is said she entered the city known as Mesembria, holding in her hand an olive branch, and thus she presented herself before the king. Seeing her, the king believed in Christ, and was baptized by the presbyter Timothy, along with thousands of others. 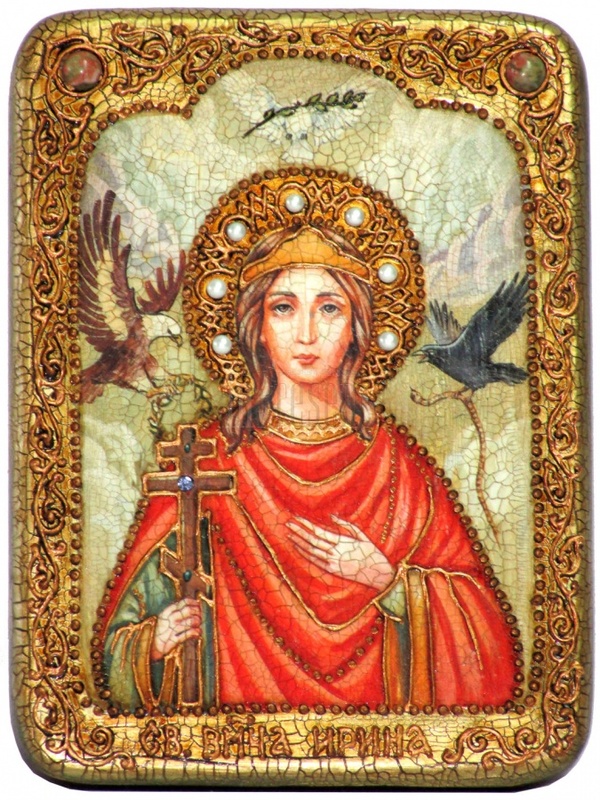 Then the Saint went to her city of Magedon to her parents, and she mourned her father who had previously died, then bid farewell to her mother. Suddenly she was taken up by a cloud, and came to Ephesus, where she stayed for a while, performing many miracles, and she was honored as an apostle. After this she was reunited with her teacher Apellian. Having taught those in Ephesus, the Saint took with her six others and Apellian, and they went outside the city of Ephesus, to a new tomb, where none before had lain. After she entered therein, Apellian sealed it with a stone. 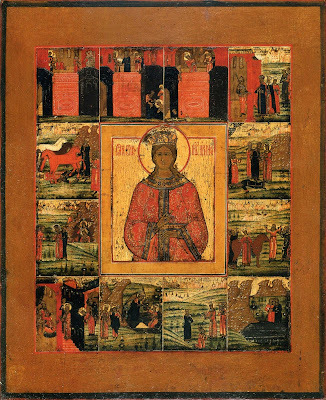 The Saint ordered that while still among the living, no one was to remove the stone placed over the tomb by Apellian. After two days, Apellian went to the tomb, and - O the wonder! - he found the stone lifted from the tomb, and the body of the Martyr was missing. 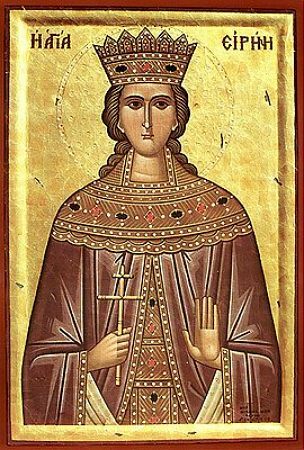 * The story of St. Irene often presents problems for people, and the accounts of her martyrdom vary from different sources. The above seems to be a compilation of the various traditions of the real St. Irene from various cities all put into one story. No doubt there is some exaggeration here, despite the author telling us to accept the account without question, in the attempt to bring them all together. One clue to this is the fact that early on the Timothy that baptized Irene is called the disciple of St. Paul, whereas in other places he is just a priest. Also, her teacher Apellian shows up in different places, as well as the twice mentioned Shapur, though in Greek the names are spelled differently. Along with the various accounts of martyrdom, the death of her father mentioned on two occasions, and other things, they indicate some sort of compilation of various traditions. 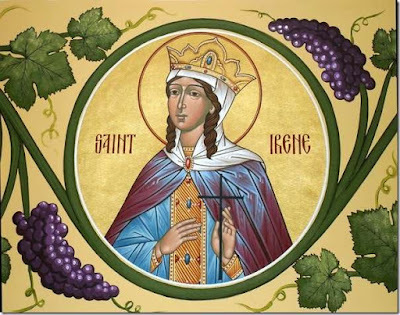 Of course, this should not diminish our faith in St. Irene, who without doubt all these accounts are based on, and perhaps shows the impact her story had as it spread to the various cities mentioned. However, it is difficult if not impossible to separate historical truth from fiction. Christ our God has called thee Irene, for thou grantest peace to those who hasten to thy church with hymns. Thou dost intercede for all before the Light-creating Trinity. Together we celebrate thy memory, as we magnify God Who has glorified thee.